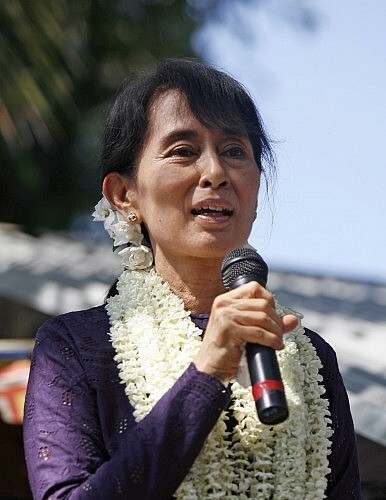 Aung San Suu Kyi calls on her party to secure strong election victory. At a meeting this past weekend, Myanmar’s opposition leader Aung San Suu Kyi called on her party to push for a landslide victory in upcoming elections. “We, the National League for Democracy (NLD) need to have a landslide win in the election,” Suu Kyi said during the close of the NLD’s two-day executive committee meeting in Yangon. “Whatever we continue to do, with the support of the people and the strong will of our party members we will be successful,” she added. Suu Kyi’s party is expected to perform well at the polls to be held later this year, though exactly how well is still unclear. In May 1990, the NLD won the election by a landslide with Suu Kyi under house arrest, even though the results were not accepted and the military continued to rule the country. In 2012, the NLD swept parliamentary elections, winning 43 out of the 44 seats that it had contested. The NLD will need all the help it can get at the polls to increase its future bargaining power. Despite Myanmar’s opening over the past few years, politically speaking the odds are still stacked against the NLD. Most critically, as of now, Myanmar’s constitution forbids Suu Kyi from running for office and ensures that the military enjoys an effective veto on constitutional change. Even if the country’s parliament moves towards amending some of these provisions ahead of the elections, the signals so far suggest that they will likely relax certain aspects of existing laws rather than significantly alter them. That will make it very difficult for some to perceive polls as being free and fair. Within this context, the NLD has been walking a tightrope. Though NLD leaders say they have begun preparations for elections – including the meeting this weekend – the party has technically yet to officially announce that it is going to run in polls. Suu Kyi’s weekend comments were also far more balanced than the media coverage suggests. She called for a landslide but stressed that the NLD would not be a “bully” if it takes power and would “make friends with enemies” in the interest of national reconciliation – a clear message to those within the ruling party as well as the military who distrust her and her party. And while the NLD intends to take the government to task on election issues like voter roll problems, she also told her supporters over the weekend to preserve stability during polls for the sake of the country. Asked recently whether she viewed the reform process in Myanmar as still going backward, Suu Kyi said that she expected neither significant reforms ahead of elections nor constitutional amendment given government opposition. “That’s regression enough, don’t you think?” The real question, though, is how the NLD’s election fortunes will shape Myanmar’s future direction into 2016. Key constitutional amendments fail to pass the country’s parliament.